In 2010, one of the largest landslides in North American history poured down the side of Mount Meager and into the creek below. It dropped an estimated 40 million cubic meters of debris in a slide 300 meters wide and 2 km long, wiping out access to the Meager Creek Hot Springs Recreation Site and temporarily damming the creek. Fast forward a few years and, thanks to the work of the UBC Varsity Outdoors Club, access to the site was restored, this time via a ridge-line trail above the creek. 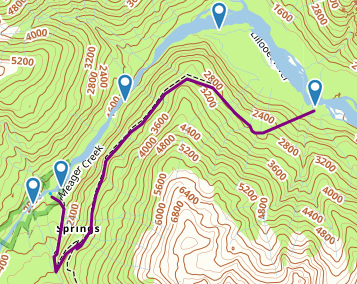 Purple = hiking route, waypoints denote the start and end of the different sections of the river. Staring at a map of the new trail, I noticed that when you connected it with the creek, it made an almost perfect loop. What's more, the creek looked like it might be runable. To make it even more appealing, I couldn't find a single report of anyone having paddled Meager Creek, before or after the landslide. Intrigued and excited we headed up the Lillooet River valley late Saturday morning to check the place out. We parked just off the Lillooet South FSR about a kilometer below a junction where the Lillooet South ends and splits into the Perkins Main and the Meager Main. From here we started hiking up the road following switchbacks between cutblocks of varying ages. Follow the orange trail blazes. The first section on the road was a grueling, continuous uphill with stunning views down the Lilllooet valley. After a little more than an hour of continuous switchbacking, we turned right and followed a long, traversing section of road around the corner into the Meager Creek drainage. Looking up the Lillooet valley. A short distance into the Meager Creek valley, the road dead ended in a massive pile of slash and debris from past logging operations. Across this, orange flagging marked the start of the VOC's Harrison Hut trail, which we would follow most of the way to the hot springs. The trail climbed up and down through forest and across cut-blocks and was more grinding that I had expected. It was enjoyable, if unremarkable, hiking. The trail was well marked and expertly built, with a number of stunning viewpoints on a sunny fall afternoon. After about five hours of hiking , I made a wrong turn at the junction where the main trail continues up towards the Harrison Hut and some overgrown logging roads descend to Meager Creek Hot Springs. A twenty minute detour later and we were descending the correct trail, following rock arrows laid on the road towards the hot springs. We arrived in the dark, after somewhere between six and seven hours of hiking (with some long breaks), some 22 kilometers of trail and logging roads. The springs were busy, but not overcrowded, with at least 5 or 6 other groups camping at the springs. The Meager Creek Recreation Site, cut off from road access by the landslide, felt a bit like a ghost town. It was strange, but not unwelcome, to find picnic tables, an outhouse and other conveniences of front and sidecountry camping after such a long hike. We set up camp and ate dinner in the dark and headed to the springs for a quick soak before bed. The next morning, I woke up early to retrieve our food bag from the locking garbage can that had been re-purposed into a makeshift bear cache and spend some time scouting the river. Based on examining topo maps before the trip, scouting from the hike-in and my morning walk up the river, I decided to split the river into four sections: the hot springs section (from the hot springs to just below the bridge at the entrance to the recreation site), the middle section (from the hot springs section to just above where Capricorn Creek enters Meager Creek), the landslide canyon (from Capricorn Creek to where the Meager Creek valley enters the Lillooet River valley) and the Lillooet Section (the rest of the creek to the confluence with the Lillooet). The hot springs section was solid Class III+, maybe Class IV, and was running at what seemed like a low/low-medium water level. I started from a big eddy right beside the main camping area, up creek from the main hot spring pools. The rapids were continuous right out the gate on this section, and many of the rocks were tough to see in the silty, grey-brown river, requiring quick moves in fast moving water. Looking down-river from the put-in eddy. Near the bend of the river where you turn out of sight from the hot springs, a half-river sweeper was especially challenging and ended up throwing me onto a less than ideal line for the lower half of this section. At the first bend below the river, I tried to recover into the primo line, but missed and ended up pinned between two large rocks. I got unstuck without too much effort, but ended up with a swamped boat and displaced seat, making the last 200 meters of the run especially challenging. The put-in at the top of the middle section. The next section started about 500 meters below the bridge, where the river starts to flatten out into a wide, braided section. I pulled out river right to meet my partner, who had decided to skip the upper section and put in on the middle section. We scouted from the eddy we hoped to put in on but found 2 sweepers and one strainer lined up around a sharp bend so we forded the creek and portaged around the wood. The next section of river was fast and fun Class II. We pulled out a couple times to scout small rapids and check for wood downstream, but only found a few partial sweepers that were easily avoided. Some small rapids on the middle section. One major hazard in this section was construction on the Meager Main a few hundred meters before the confluence with Capricorn Creek. While we were running the creek, two large back-hoes would intermittently drop boulders over the edge of the road grade, making terrifying sounds and sending some crashing into a far-river right bend in the creek. We chose to pull out and portage far to the river left around the entire section to minimize any risks. Shortly after this bend, a river wide sweeper forced us into another portage, just above the confluence of Meager Creek and Capricorn creek. Portaging river-wide wood just above the canyon section. By this point, the rain had really kicked up, along with an icy wind. To make matters worse, my partners boat had sprung a small leak, and the upcoming section looked fast and technical, with few opportunities to eddy out and portage rapids. We scouted a bit and decided to try and portage around the confluence, hoping the river leveled out a bit past the landslide site where high debris walls formed a sort of canyon section. We hiked up to a high vantage point but couldn't get a good read of the river, so continued up the Meager Main road grade. From here we could see the river was consistent Class III+/IV as far as we could see. And, in climbing up to the river we had put ourselves on top of a massive sheer, wooded slope we would have to descend to regain the river. Looking down at the start of the canyon section. Capricorn Creek is to the right. It was already mid-afternoon and the weather seemed to be deteriorating so we made the call to hike back to the van from there, about 5km on the Meager Main, abandoning hopes of a possible first descent and settling for a partial one. From the road, it looked like creek mellowed out again to Class III/III+ about 1km above the confluence with the Lillooet, and that the Lillooet was steady Class II/II+ back to the car, but this section could do with a closer scout/test run. Another option we noticed would have been to ferry across the creek below the final log portage, ford Capricorn Creek and do a long portage to the Lillooet and run the creek from there back to the parking area, a preferable option to the road portage for skipping the landslide canyon section. Looking out towards the confluence of Meager Creek and the Lillooet River, making plans to come back and finish the run. We made it back to the car a little over an hour later, cranked up the heat, got into dry clothes and devoured a bag of chips. Five minutes later, we were already figuring out a plan to come back and run the whole creek.